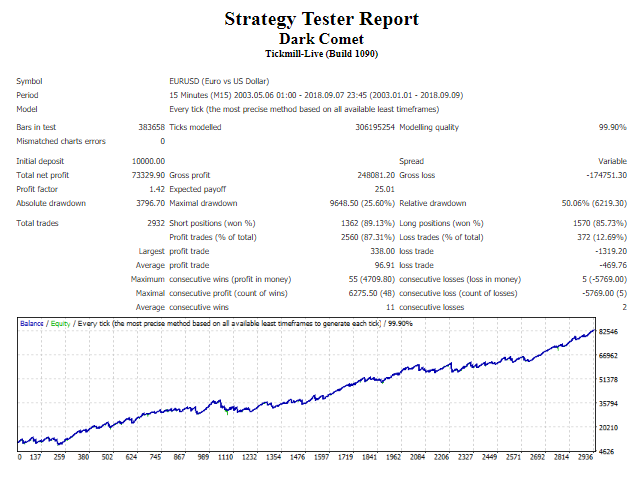 Dark Comet is a fully automatic Expert Advisor for Long Term and Intraday Trading. 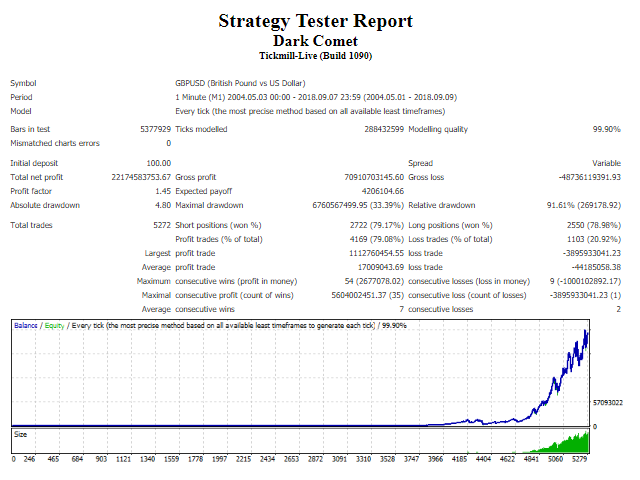 Dark Comet is based on an artificial intelligence algorithm that allows to predict and anticipate the trading Signals that it uses. 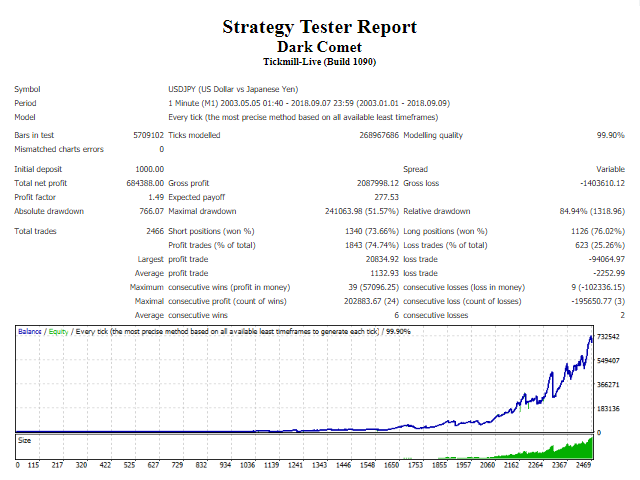 In this way, the expert advisor is able to get a very high-rate of winning trades. 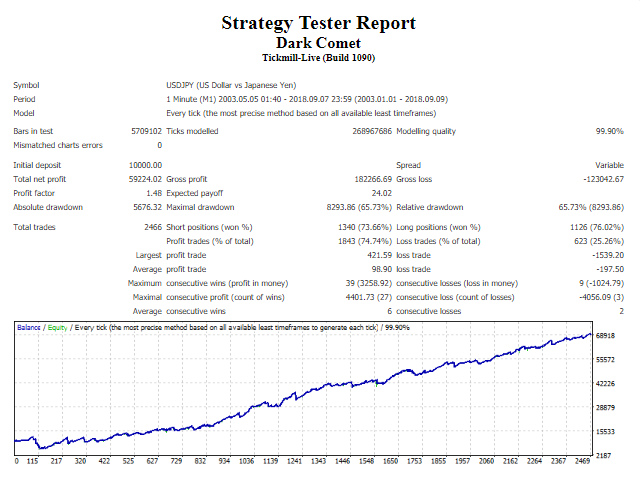 The Expert was tested on the whole available historical period in EURUSD, GBPUSD, USDJPY and EURJPY with good results. You can download the demo and test it yourself. My tests were performed with the real tick date with 99,90% accuracy, actual spread, additional slippage and High commission. The Expert Advisor uses many Indicators and Price Patterns to identify the entry points. You can find the complete list of parameters in the parameters section blog. 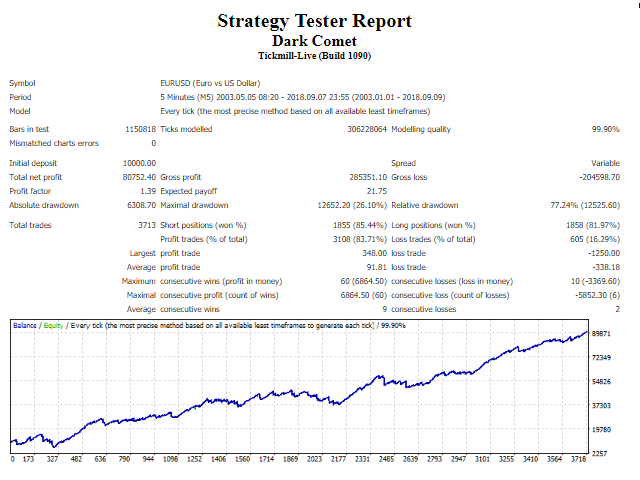 The strategy is based on Trend Retracements. The expert pinches the opportunities on deviations from the trend, in Trend Following. 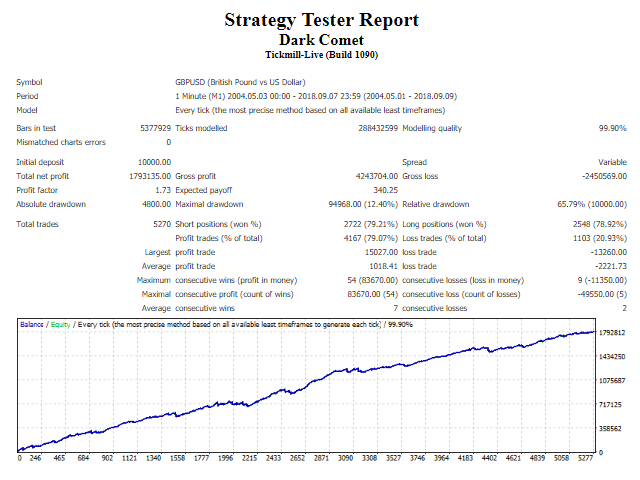 This Expert Advisor NOT Use Martingala, pyramid, grid, night trading, scalping, arbitrage, high frequency trading, hedging or other Dangerous strategy, All orders have Stop Loss and Take Profit. This robot does not use scalping, the operating frequency is low, we estimate an average of 1 order per day with all the couples entered. No Overfitting: the robot works with the same settings on more than one pair. it has also been optimized only from 2010 to 2018 on eurusd, but it also works well on gbpusd and in previous periods (2004 - 2010). Different types of data, spreads, slippage and conditions were used, the results in any case, are similar. 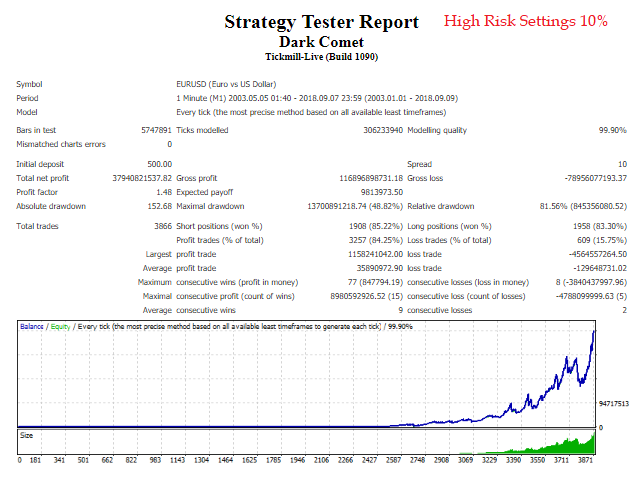 Dark Comet must be evaluated in the Long Term, the minimum evaluation time is 3 months. The default settings can open a maximum of 11 orders, All orders are managed individually. In addition, all settings are external, so that everyone can set the robot as they wish. The Recommended Timeframe is M15, H1. it is possible to find settings for other timeframes, the timeframe must be selected internally to the Expert. The recommended pair is EURUSD, GBPUSD, USDJPY and EURJPY. You can test this robot in other pairs. The recommended Leverage is 1:30 or More and minimum deposit recommended starts from $1000. Auto Magic Number: Auto ID number of the orders. 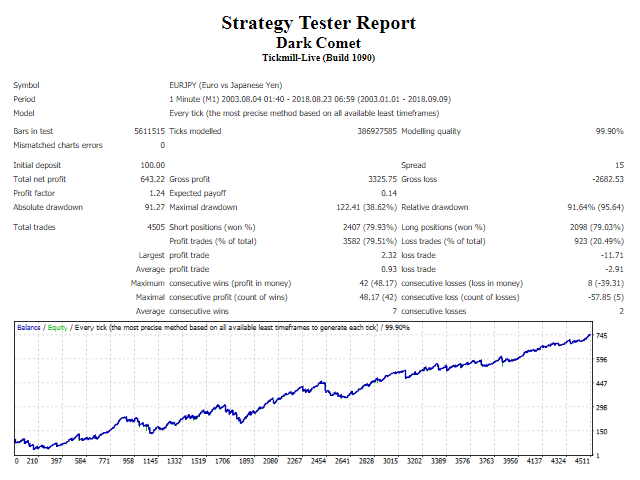 Max Spread On Close: Max Spread, applied for close trade. Indicators Timeframe: Timeframes where the indicators are placed. Maximum Trades: Maximum number of trades, open at the same time. 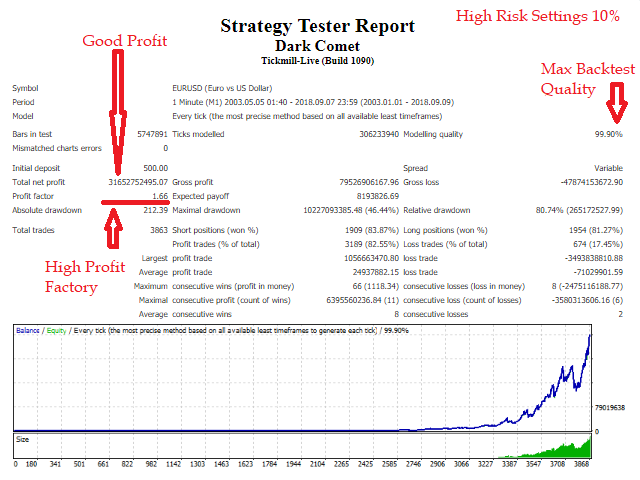 Take Profit: profit target in points. Stop Loss: maximum loss per point order. Enable Entry 1: if true, Enable Entry 1.